The TWK7203GB kettle boils rapidly and has some great features that make it easier to use. It will add a touch of style to any kitchen, coming in a silver and black stainless steel finish. 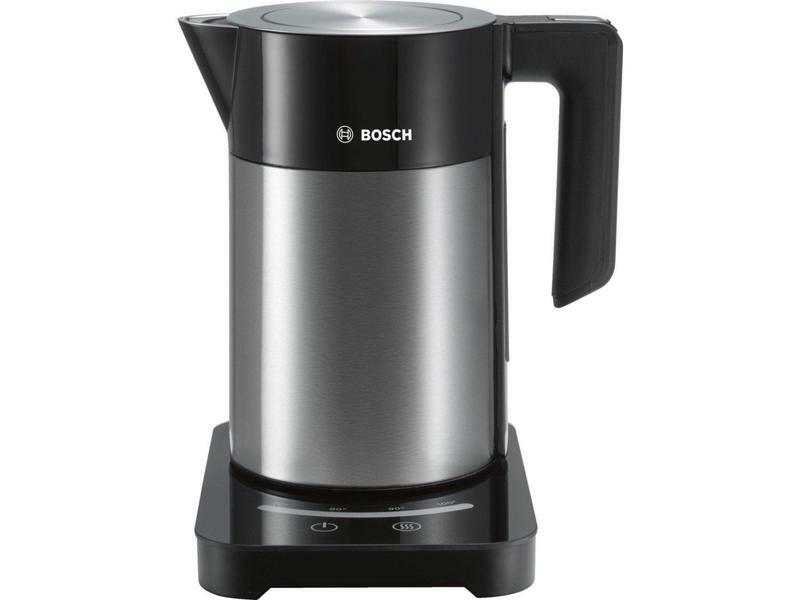 This Bosch Sky kettle can hold up to 1.7 litres of water, which is more than enough for six cups of tea – perfect for when any guests call round. To make sure you don't overfill the kettle, there is a water level indicator marked in both litres and cups – this prevents water waste and saves energy. Thanks to 3000 Watts of power and the rapid boil function, you’ll never be waiting very long for your drink. As this Bosch model is cordless, you’ll find that it’s practical, safe and easy to fill. The 360o base means you can put the kettle on at any angle, and non-slip feet keep it secure on your work surfaces, even in the busiest of households. Due to the simple design, the Bosch TWK7203GB is easy to clean – there is a wide opening to help emptying and refills, along with a concealed element. This kettle also has a handy removable filter to guarantee tasty tea that is limescale free. With its silver/black design, square base and innovative features, the TWK7203GB adds a modern twist to a traditional appliance. The kettle itself is made from double walled stainless steel – not only does this keep water hotter for longer, but it also keeps the exterior cooler than other models. On the black base, you’ll also find easy-to-use touch controls. Here, you can switch on the kettle and adjust the TemperatureControl indicator, which allows you to set the water’s heat. Changed your mind during the boiling process? Not to worry – you can also use this indicator to monitor the water’s heat throughout, and stop it at your new preferred temperature. When your water has reached your desired temperature, an acoustic signal will let you know. You’ll even find a ‘Keep Warm’ button, which keeps the water at your set temperature for 30 minutes after the kettle has boiled. The TWK7203GB kettle provides great peace of mind thanks to its three-way safety system. This helps prevent accidents and even increases the appliance’s life. Overheating and run-dry protection are also included, so the element won’t be damaged if you forget to fill the kettle. It turns off automatically when it’s finished boiling, and when the kettle leaves the base. 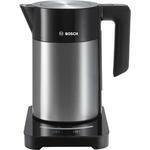 Buy the Bosch TWK7203GB kettle today – it's reliable, stylish and makes a lovely cup of tea.